The best things about changing seasons are the seasonal menus across restaurants. 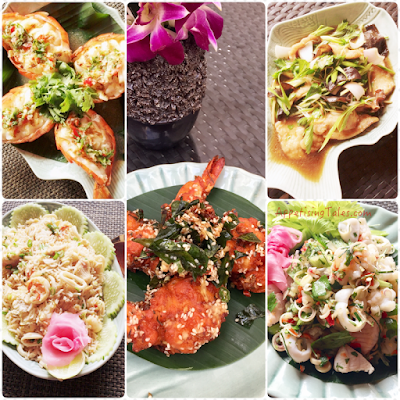 If you enjoy seafood, the new Winter Collection menu at Spice Route, The Imperial New Delhi will surely delight you. Although the restaurant is famed for offering the finest Thai fare in Delhi, it actually serves a choice of South-East Asian cuisine as well as that of coastal India, especially the region along the erstwhile spice route. Chef Veena Arora, chef de cuisine, Spice Route, was born and brought up in Thailand. Even after she started living in India Thai food continues to be cooked at her home everyday. But having said that, she enjoys experimenting with other cuisines in her home kitchen as well as her professional space. One thus finds Chciken 65 inspired crisp and spicy Yera arvat anjj (stir fried tiger prawns with ginger, chillies, Kerela spices and yoghurt) and flavourful Meen rassam (mixed seafood rassam, tempered with Kerala spices) alongside the fresh and aromatic Yum thalay (Thai spicy sea food salad with tom yum paste, lemon grass and Kaffir leaves) or the hearty Khao phad thala (stir fried rice with sea food, flavoured with sri-racha sauce). And while the Malay Rendang curry typically features lamb, Chef has made it for this menu with succulent prawns in keeping with the season. The stars from the Winter collection for me are the seafood salad and the Kadugu meen masala. The latter is sole filet cooked in a delicious curry made with mustard and cumin paste. It is certainly one of the better meen masalas I have had. Left Top: Kung Tein; Left Bottom: Khao Phad Thalay. Center: Kerala Style Stir Fried Prawns. Right Top: Phad Khing Pla; Right Bottom: Yum Thalay. Sharing a table with Chef Veena leads to motherly pampering, lots of talk about good food and sharing of cooking tips (one-sided, of course!). In case you like to watch your weight and want to avoid calorie-laden coconut milk or deep fried foods, she suggests limiting portions or eating these dishes infrequently, "but whenever you do, they must be made the traditional way". The one ingredient that she cannot do without is the Tiparos fish sauce and her go to fish is sole for filet or pomfret for whole fish. And when I asked her to share a recipe for you from the new menu, we hit jackpot, dear reader! Not one, but she gave us four delicious and easy to follow recipes. So without wasting more time, just dive into the recipes, collect the ingredients and get down to cooking up a storm, ‘cos you don’t get such recipes from an award winning restaurant every day! The Imperial, Janpath, New Delhi-110001. Lunch & Dinner: 12:30pm - 2:45pm | 7:00pm - 11:45pm. Meal for Two without alcohol: INR 10,000 plus taxes. Call at 41116605 for reservations. Spicy hot and sour mixed seafood soup, flavoured with lemongrass, galangal and kaffir lime leaves. Add the cube then the herbs and the rest of the ingredients. Bring it to a boil and serve hot. Mixed seafood rassam, tempered with Kerala spices. · Make Rassam Powder: roast black pepper whole, whole coriander seeds and cumin seeds. Grind it all. · Boil lentils (arhar dal). · Boil tomatoes with ginger, garlic and rassam powder; strain it. Add lentils to it. Pour oil into the wok, add mustard, dry red chilli whole, curry leaves and turmeric powder, and then pour it into the tomato mixture. Add salt to it then the seafood and simmer till the seafood is cooked. Garnish with fried curry leaves. Note: The soup should be spicy in taste and can be served with steamed rice. It is extremely good for winters since it is infused with Indian spices and seafood which helps in combating the harsh cold due of the winter season. Stir fried rice with seafood, flavoured with Sriracha sauce. · Cook the rice. Cut the prawns into small pieces and chop spring onions. · Pour oil into the wok add garlic, stir till light golden color, then add prawns, fish and squid. Stir till it is done. · Now add the cooked rice then all the rest of the ingredients, leaving half of the spring onions for the garnish. · Before serving garnish with cucumber and half lemon sliced. Wok fried slices of sole with ginger, black fungus in oyster sauce. Slice the fish into small pieces. Dust the fish with tempura flour and fry till light brown. Pour oil into the wok, then add garlic and stir till light golden. Add fish, followed by ginger juliennes and diced onion. This article first appeared on indiatoday.intoday.in on December 15, 2016. It has been modified by the author to fit the requirements of AppetisingTales.com.